This application protocol describes the procedure to dissociate mouse spleen, lung, and intestine using the gentleMACS™ Dissociator and specific tissue dissociation kits in order to obtain viable subsets of DCs that can be further isolated using MACS® Cell Separation Technology or flow sorting. Prepare a solution containing phosphate-buffered saline (PBS), pH 7.2, 0.5% bovine serum albumin (BSA), and 2 mM EDTA by diluting MACS® BSA Stock Solution (# 130-091-376) 1:20 with autoMACS® Rinsing Solution (# 130-091-222). Keep buffer cold (2–8 °C). (Sterile) 1× Hank’s balanced salt solution (HBSS) without Ca2+ and Mg2+ containing 10 mM HEPES. Store at room temperature. This solution is referred to as HBSS (w/o) in the protocol of the kit data sheet. (Sterile) 1× HBSS with Ca2+ and Mg2+ containing 10 mM HEPES. Store at room temperature. This solution is referred to as HBSS (w) in the protocol of the kit data sheet. (Sterile) Predigestion solution: prepare 1× HBSS (w/o) containing 5 mM EDTA, 5% fetal bovine serum (FBS), 1 mM DTT freshly before each digestion. Store at room temperature. ▲ Note: Per digestion a volume of 40 mL of the predigestion solution is required. (Sterile) Digestion solution: prepare 1× HBSS (w) containing 5% FBS freshly before each digestion. Store at room temperature. ▲ Note: Per digestion a volume of 2.5 mL of the digestion solution is required. (Sterile) PB buffer: prepare a solution containing phosphate-buffered saline (PBS), pH 7.2, and 0.5 % bovine serum albumin (BSA). Keep buffer cold (2–8 °C). ▲ Note: BSA can be replaced by other proteins such as mouse serum albumin, mouse serum, or FBS. MACS Columns and MACS Separators: CD11c+ cells can be enriched using MS, LS, or XS Columns. Positive selection can also be performed on the autoMACS Pro Separator. (Optional) Fluorochrome-conjugated CD11c antibodies for flow cytometry analysis, e.g., CD11c-VioBlue® (# 130‑102‑413). Learn more about our antibodies and dyes. Use the Spleen Tissue Dissociation Kit, mouse to generate a single-cell suspension for subsequent isolation of dendritic cells. The kit is designed to ensure high viability of CD11c+ cells and to preserve epitopes for cell isolation and staining. Follow the protocol of the kit data sheet. Suspend cells in PBE buffer and determine cell number. Use the Lung Tissue Dissociation Kit, mouse to generate a single-cell suspension for subsequent isolation of dendritic cells. The kit is tissue-specific and designed to ensure high viability of isolated cells. With preserved epitopes, the cell suspension is optimal for cell isolation and staining. Follow the protocol of the kit data sheet. Clear small intestines of feces and remove Peyer's patches. Digest remaining tissues to obtain the lamina propria lymphocytes. All steps are described in detail in the protocol of the Lamina Propria Dissociation Kit, mouse. Pan dendritic cells (DCs) are enriched from each of the dissociated tissues with CD11c MicroBeads, UltraPure, mouse. The isolated tissue-derived DCs show specific surface markers that enable the detailed analysis of distinct DC subsets. Follow the protocol of the data sheet for the CD11c MicroBeads UltraPure, mouse, to isolate the CD11c+ dendritic cells for each of the cell suspensions. The negative flow-through fraction is discarded and the positive fraction contains the CD11c+ to be analyzed by flow cytometry. Stain the isolated CD11c+ in PBE buffer for 10 minutes at 4 °C with the respective antibodies listed in the table below. Perform flow cytometry on the MACSQuant® Analyzer 10 and analyze data with Flowlogic™ V7. Dendritic cells and macrophage phenotypes of single-cell suspensions from mouse spleen, lung, and intestine tissues, before and after cell enrichment. (A) Dissociated cells were stained with the specified antibodies and analyzed by flow cytometry. Cells were gated on the PI– population. (B) Pan DCs and CD11c+ macrophage populations were enriched with the CD11c MicroBeads Ultrapure, then stained with the specified antibodies and analyzed by flow cytometry (gated on PI– population). (C) A comparison of CD11c+ populations before (blue) and after (red) enrichment with the CD11c MicroBeads UltraPure, mouse (gated on PI– population). Enrichment gave viable pan DCs, including specific myeloid (CD11b+ and XCR-1+) and plasmacytoid (PDCA-1+) DC subsets. Dendritic cells and macrophage phenotypes of single-cell suspensions from mouse spleen, lung and intestine tissues, before and after cell enrichment. 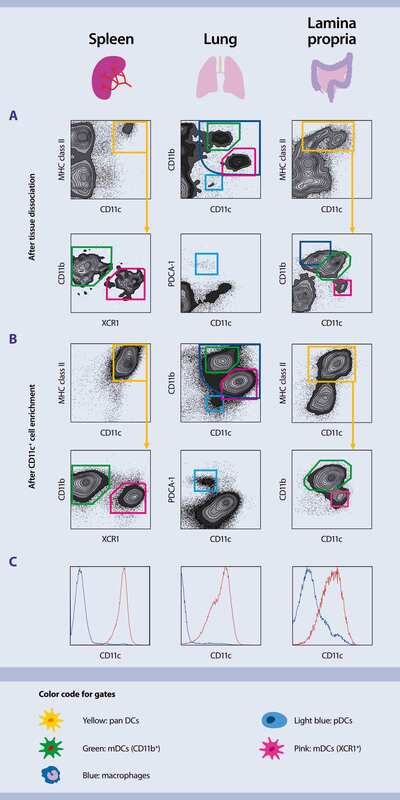 (A) Dissociated cells were stained with the specified antibodies and analyzed by flow cytometry. Cells were gated on the PI–population. (B) Pan DCs and CD11c+ macrophage populations were enriched with the CD11c MicroBeads Ultrapure, then stained with the specified antibodies and analyzed by flow cytometry (gated on PI– population). (C) A comparison of CD11c+ populations before (blue) and after (red) enrichment with the CD11c MicroBeads UltraPure, mouse (gated on PI– population). Enrichment gave viable pan DCs, including specific myeloid (CD11b+ and XCR-1+) and plasmacytoid (PDCA-1+) DC subsets. Merad, M. et al. (2013) Annu. Rev. Immunol. 31: 563–604. Malissen, B. et al. (2014) Nat. Rev. Immunol. 14: 417–428. Plantinga, M. et al. (2010) Eur. J. Immunol. 40: 2112–2118. Denning, T. L. et al. (2007) Nat. Immunol. 8: 1086–1094. Fujimoto, K. et al. (2011) J. Immunol. 186: 6287–6295. Steinman, R. M. and Cohn, Z. A. (1973) J. Exp. Med. 137: 1142–1162. Steinman, R. M. and Cohn, Z. A. (1974) J. Exp. Med. 139: 380–397.